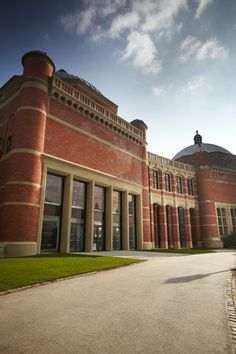 ‘When these buildings are complete, they will be the best of their kind in Europe and perhaps the world.’ Joseph Chamberlain, Birmingham University’s first Chancellor. 100 years after the opening of the original Aston Webb building, the iconic, red-brick heart of the University since 1909, the Bramall Music Building finally completes Joseph Chamberlain’s original architectural vision. Providing the University’s outstanding Music Department with a permanent home at the heart of the University, with state-of-the-art teaching, research, performance and rehearsal facilities appropriate to its reputation, this £16 million facility benefits everyone involved in the University’s elite and inclusive music-making and performance as well as being open for use by our regional communities. 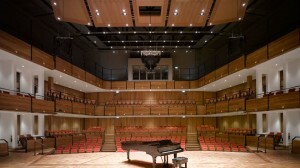 The 450-seat auditorium is the most flexible performance space at a UK university – suitable for performances from solo voice, early music, to a full symphony orchestra. When not used for music, it is a high profile location for drama and dance performance and for prestigious lectures.